I will also provide a compatibility CD that will allow the game to run under ALL VERSIONS of Windows 10, 8, 7, Vista and XP, both 32 and 64 bit. Note: I do not have a PDF manual for the game. Through a slick system of intricately woven world events and outside influences, Millennium Auction creates a dynamic environment where the world's greatest cultural treasures are up for grabs. Pop culture items like the Hubble Space Telescope or world renowned works of art such as the Michelangelo Pieta sculpture are available to the highest bidder. But you must do your homework. Only through detailed research and investigative skills will you discover if an item is a fake, or if some world event is causing the value of the item to plummet or soar. 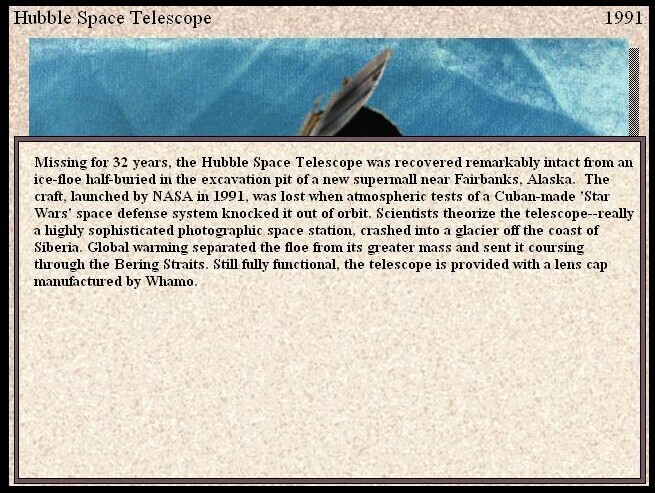 You have various techniques of discovery at your disposal. Study dossiers on your fellow bidders, review media reports, build your own portfolio by buying low then selling high or hold on to those items of greatest worth, look for bargains and ways to combine items for even greater profits. You'll bid on a randomly selected 12 items in each session with the ultimate goal of having the highest net worth of the four bidders (out of a possible seven) at the end of the day. 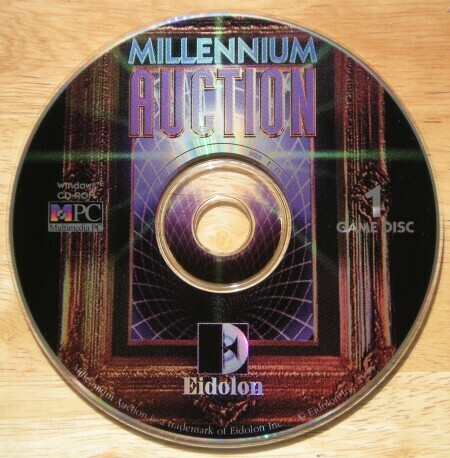 Millennium Auction offers the rare gaming experience where the road traveled can be more satisfying and fun than the end result of getting there. The meat of the game is in the time spent determining the worth of each item (in relation to others and with an eye to world events and research) and planning your strategy to cover the full days auction. With 12 items available, your initial Auction Cap of $8.5 million UN dollars won't go far. Only through careful manipulation, good instincts and capitalization on opportunities to turn your items into profit will you accomplish your goal. Full motion video of the major players in the game (newscaster, bidders, auctioneer, etc.) is a treat as are the crisp views and descriptions of the items to be auctioned. To help you find your way around the World Body Auction House you have access to a tutor-like entity named Nuria. Using your worldwide online bulletin board, the ArtNet, you monitor item values, sell items from your acquired collection, conduct investigations and research related to the auction pieces and use the calculator to keep track of your profit margin. Information is handled through a futuristic virtual reality interface called "InfoLink," where you can register for the auction and find out about the latest prices for items in the auction. Once you register and enter the auction house, you have your choice of starting the bidding or scavenging for information by gossiping with other bidders, or read and watch the news. As in the real world, world events can effect the value of the items for sale. A political uprising to a tsunami could raise or lower the value of a work of art, and so you must keep abreast of world news to maximize your profit. You can browse the catalogue of the artwork that is up for auction before the bidding starts. Each auction features 12 items, ranging from genuine works of art (a Van Gogh or Renoir painting, for example), to the satirical (Bill Clinton's saxophone from his 1992 presidential campaign), and finally to the wholly fictional (a sculpture made in 2004). Each auction has three rounds, so four items are bid on per round. Needless to say, it's much more difficult to gauge the value of a fictional item than a real one, and the game has more than a few "red herrings" - worthless objects that can fool you into spending a lot of money on, only to discover their true (low) value later when you try to sell them. Your opponents may also give you false information, so since you have limited funds, it's very important that you cross-check all available sources to determine which objects among the 12 are the most valuable. Not only do you need to consider the worth (and the future worth) of each item, but also how much you can afford the work. Some works also sell better as "groups", so purchasing selected pieces to sell together later is one way to make a killing in the game. Overall, Millennium Auction is a refreshingly original strategy game that is a lot of fun, especially when you play with friends. 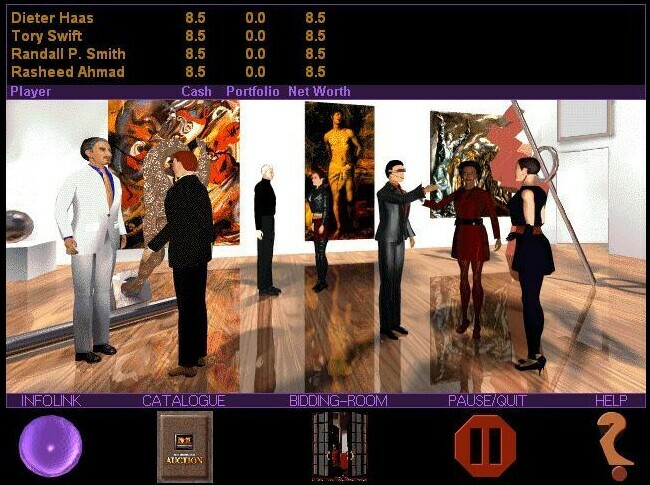 The game's good descriptions of many real works of art make it an educational title to boot (although sometimes it's hard to tell the "fake art" apart from the real thing). If you are in a mood for a "lite" and unique business strategy game, check out this lost gem.